Go to Metropolia Business School Facebook page and share the ribbon! There has never been such a green day as today. The colour green stands for various things. For example there is a green awareness ribbon which stands among other things for environmental protection. Moreover the colour green signifies nature, life, youth, safety and hope. It also represents the start of something new as it is the first sign that spring comes when the first flowers look out of the snow and trees start to get fresh green leaves. Green also corresponds with safety and especially dark green is associated with money and wealth. The calming and relaxing effect of colour works even for teachers as a study proved that they tend to find fewer mistakes in green painted and lighted rooms. Sounds to me like Metropolia needs redecoration. Green Party is associate with ecological friendly actions, social justice and nonviolent behaviour. The raise of the green politics is connected with the general green movements within the society and a response to the industrial revolution. It is no incident that 49 countries use a shade of green in their national flag, as it has so many positive associations. Furthermore green is especially in islamic regions popular because it is considered to be sacred. The american punk-rock band “Green Day” has chosen this name because of their relations to pot. Not a good reason, but good music. Also Kermit from famous Muppet Show has something to say about “Being green”. Green is everywhere – Did you have a green day? 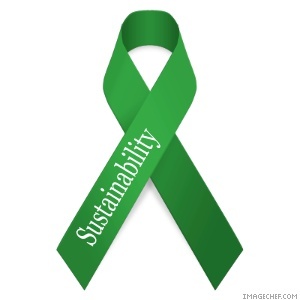 If you are, please share the green “sustainability” ribbon from Metropolia Business School Facebook page with others. If not, Metropolia World Week will show you how to earn a green ribbon for environmental awareness! Even so shopping is not exactly environmental friendly you might want to go and buy some green clothes, get ready, there are only 4 days left! Next Post The Iron Lady – Live a Life that matters. salutations from across the ocean. Great blog I must return for more.